Peter has 14 years experience as a Maintenance/Installation Engineer of Commercial Lifts, something that has given him a high level of skill and expertise in this area. He decided 15 years ago to design a water powered elevator to suit home and light commercial. These were also being used overseas. He is also a Qualified Lift Inspector and Electrician. He has been in the lift industry and in his own Company for over 20 years. If required we could give you copies of dozens of Testimonials from very satisfied customers. 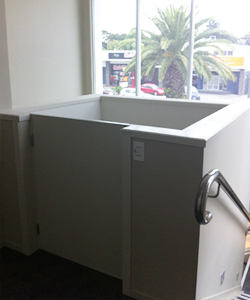 Call our toll free number now to arrange to view one of our lifts here in Tauranga or to view a lift in your area.